The Redi-Flange joins valves, fittings and equipment with integral flanged ends to plain end pipe, without the need of pipe end preparation. Absolutely no threading, welding, or grooving is necessary. The working principle of the Redi- Flange is relatively simple. Slide the flange over plain end pipe and follow it with a standard mechanical joint gasket. 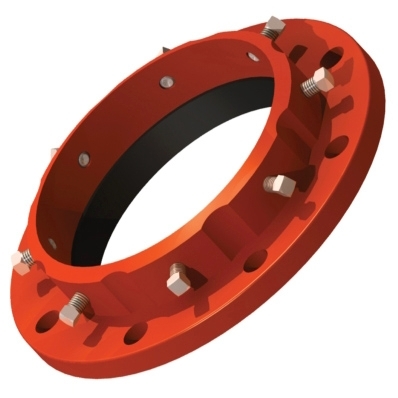 When the Redi- Flange is brought to mate against an existing flange, and the flange bolts are tightened, a compression type seal is created against the mating flange, and pipe surface. End restraint is provided when the set screws are tightened. 2. Drilling to ANSI B16.1 - 125 lb, ANSI B16.5 - 150 lb. Model - RFC-2/RFS-2 - 125 lb./150 lb. Model - RFC-4 - 125 lb./150 lb.